The damage caused to infrastructure by tree roots; is an everyday observation for most tree managers and tree owners. However, advancement in the knowledge and understanding of trees; the elevated appreciation of their importance; the vastly improved ways we can manage and maintain them as an urban asset; has influenced better outcomes in terms of infrastructure and surface protection. Long-term observation of tree root behaviour in Perth’s coastal sands have led to some successful low cost innovations that can be incorporated into Perth’s current development practices, with only minor construction modification. One such innovation is the development of Camilaflex SORB [spray-on root barrier]. To achieve this, The Arbor Centre approached Cameleon to assist them in the development of a protective coating that could be used as a seamless root barrier and meet specific product criteria. Extensive field trials conducted in collaboration with The Arbor Centre has led to its successful specification, with it’s high-build and flexibility, and integration into the marketplace. 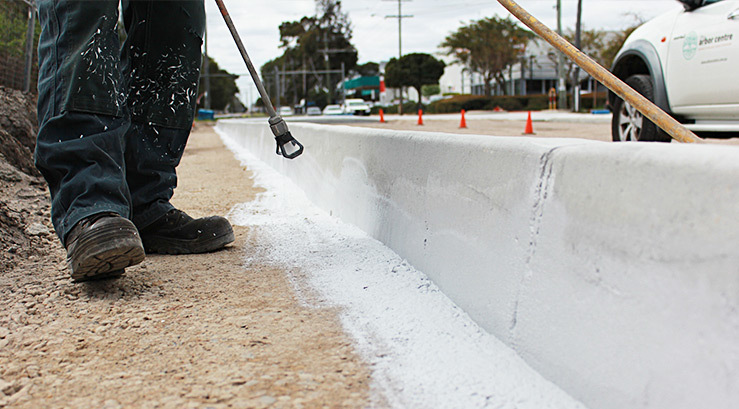 Resulting in a number of local councils, developers and main roads specifying Camilaflex SORB for use in car parks and on road verges where trees are in close proximity. By treating the area directly adjacent to a tree and its roots, we can influence better outcomes in terms of the surface protection. More specifically, by using products like Camilaflex SORB and using our expertise to provide an integrated solution around both techniques and treatments, we are able to optimise infrastructure and tree surface longevity. Camilaflex SORB is a premium quality, water based acrylic membrane coating that has been specifically formulated for use as a Spray On Root Barrier. Applied directly to road base and surrounding soils or in the interior section of below ground retaining structures for garden beds, where trees, shrubs and large plants will grow long term. Camilaflex SORB has the ability to bridge cracks and gaps up to several mm and has very low moisture permeability. When sprayed to garden bed bases and roadside garden trenches, it produces a seamless, waterproof, flexible membrane with the ability to act as a root barrier.